Taking into account circumstances, recipe changed a bit (I did not add shallots and saffron I just have Imeretian). Heat a spoonful or two of oil in Tazhin. To prevent it from cracking, heat over medium heat on the divider. Fry chopped onions til golden color, reduce heat, add ginger, cinnamon sticks, salt, pepper, chicken, saffron water. Cover with lid and leave for 45 min. At this time, begin to knead dough into round flat cakes. Clean pears, divide into quarters, take out the core. Melt butter in a skillet, add honey and stir. Add pears there and caramilize well till degree of liquid boiling. Sprinkle with crushed cinnamon. Separately fry sesame to light golden, but keep watching not to burn it. In 45 min from beginning of stewing add fruit in tazhin, stew for another 15 min (at that time ksra should already bake). Sprinkle with sesame and serve hot. Of course, for Moroccan dish must be appropriate bread, especially since its so easy to dip it in sauce. This anise bread is called Moroccan ksra . Mix some water, sugar and yeast, mix with the rest of ingredients, knead dough, leave for 30 min in warm place. Then divide in 2 or 4 parts, make good flat cakes, spread on baking sheet, grease with oil and sprinkle with sesame (instead of greasing, you can grease hands with oil before divition of dough). Bake for 20-25 min, at 200℃. You can spread dish in plates, or you can eat, as it said in book: right from Tazhin together, each from his side, breaking applauder by hands. Very interesting, warm, spicy taste, thank you girls for recipes. And OVERVIEW. Even if you do not Tazhin, all this yummy can be incredibly good cooked in a pan with thick walls. 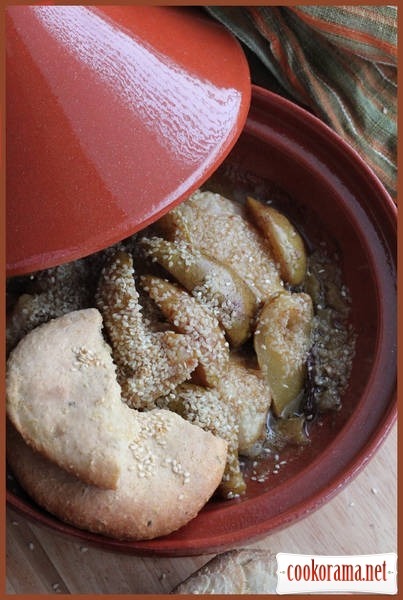 Top of recipe "Tazhin with chicken and caramelized pears and Moroccan ksra"